For "one on one" training see the Rates And Services Tab above. Want a group fitness class? Build your own class with your friends, family, or co-workers! Monica is a certified American College of Sports Medicine personal trainer and has worked with various levels of individuals including, weight loss, on-site office gyms, seniors, and special needs. Get Fit with Monica can provide a class at your building, gym, American River College, or a nearby park. Meet at the location of your choice, or different locations to keep it interesting! Don't have buddies to work with? No problem, click on the "Contact Us' button and send your name, contact number, fitness level, and preferred times and locations for possible group fitness. If a class forms with your specifications, Monica can match you with an appropriate class. ACCOUNTABILITY GROUP ONE TIME CLASS: $28 per person for one class, minimum 3 people. Ideas/discussions on implementing accountability to the group, where to begin, when to advance, the actual workout, and other customizations as requested by group. The group will receive written instructions with a Google Shared Document for each of the group members and includes follow up from Monica to check in on results. Please call or contact through the above "Contact Us" button if you would like training for private group sessions at your office, or another specific location. 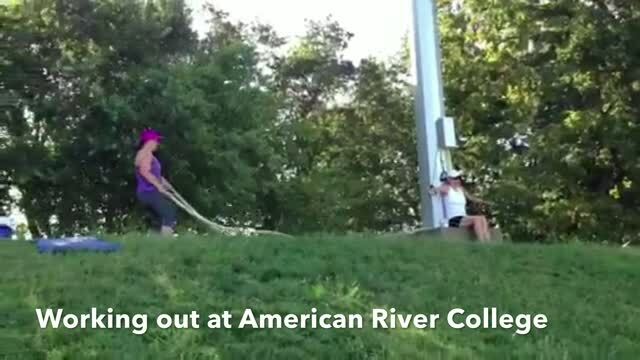 Check out a couple of the videos below to see some workouts from American River College. Personal Trainer in home, Personal Trainer at work, Mobile Personal Training, In home personal Training by Get Fit with Monica!